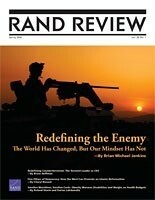 The cover story argues that new threats to national security represent fundamental changes in the ecology of conflict. Related stories characterize terrorist leaders as corporate CEOs and suggest how the West could promote an Islamic reformation. A story on obesity charts the growing costs and disabilities associated with the epidemic. Shorter articles discuss the deficiencies of educational proficiency standards and the need to retain wind tunnels. News items cover the varied levels of preparedness for homeland security, the shifting South Korean attitudes toward America, the trends shaping the future workplace, the positive influences against smoking among African American youth, and the ability of new clinical interventions to erase disparities in care for depression. Jenkins, Brian Michael, Bruce Hoffman, Cheryl Benard, Roland Sturm, Darius N. Lakdawalla, Philip S. Anton, John P. Godges, and Paul S. Steinberg, RAND Review: Vol. 28, No. 1, Spring 2004. Santa Monica, CA: RAND Corporation, 2004. https://www.rand.org/pubs/corporate_pubs/CP22-2004-04.html.